1. Cook the onion, mince and seasoning in a large saucepan for 5 minutes until browned. Add the apricots, olives half the lemon zest and juice and stock, cover and simmer gently for 15 minutes. Season and stir in half the coriander. 2. Meanwhile, place the couscous in a bowl with the remaining lemon zest and juice, pour over 200ml boiling water, cover and leave for 5 minutes. Fluff up with a fork and stir in the remaining coriander. 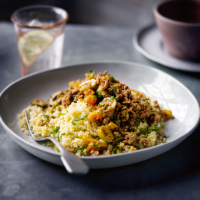 Serve with the Moroccan mince.